(Bloomberg) -- Ontario’s finance minister is poised to lay out a long-awaited schedule for balancing the books of Canada’s provincial powerhouse as he attempts to wrestle down the deficit without too many disruptive cuts to public services. Victor Fedeli is promising a “Goldilocks approach” to eliminating a projected C$13.5 billion ($10.1 billion) fiscal shortfall on Thursday when he unveils the Progressive Conservative party’s first budget since taking power in June. The C$864-billion economy, generated by about 14.7 million people, represents roughly 40 percent of the country’s output. It’s also the world’s largest sub-sovereign borrower, according to Moody’s Investors Service, which cut the province’s debt rating to Aa3 on Dec. 13, due to its fiscal challenges. 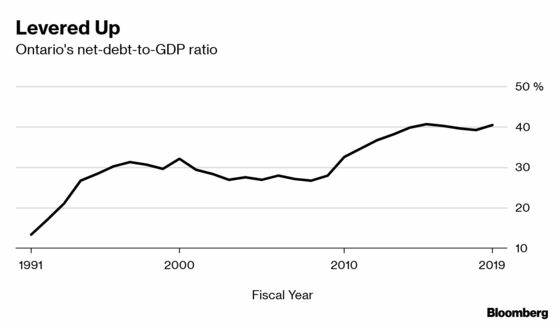 With net debt of about C$346 billion, it may also be starting to become a potential risk to Canada’s AAA credit rating. Last month, Fitch Ratings said the combined level of provincial and federal debt is close to “a level that is incompatible” with the country’s current top rating. “Ontario’s importance is huge, that’s the reason why it’s important that over the medium-to-long-term perspective that it has a healthy fiscal situation,” Robert Hogue, a senior economist at Royal Bank of Canada said in a phone interview. Hogue said the deficit in the last fiscal year may come in below the government’s C$13.5 billion projection as it likely applied amounts set for contingencies to the bottom line. Reducing the deficit to single digits at the end of the current fiscal year would “set the tone” that the government means business, he said. The government should also restore a target to reduce the debt-to-GDP ratio which is forecast at 40.4 percent for fiscal 2019, said Hogue. That’s surpassed by only Quebec and Newfoundland and Labrador. The government said it has already implemented more than 200 measures to improve efficiency, announced funding cuts to universities, some health services and said it will implement a centralized procurement system that will eventually save it C$1 billion a year. It’s also looking to find savings in public service salaries, which represents roughly half the governments expenditures at about C$72 billion annually. Among its plans is to increase class size for high school students and negotiating “voluntary” agreements to limit wages. While the government is focusing on increasing efficiency in the short term, it is also pushing ahead with long-term investment plans such as a C$28.5 billion expansion of the subway lines in Toronto over the next 12 years, according to a statement Wednesday. To be sure, the province has been growing steadily, fueled by the second-largest financial center in North America after New York, a construction and tech boom and a steady stream of immigrants. Gross domestic product is forecast to expand by 1.9 percent in 2019, the fastest of any province except British Columbia, according to economists’ estimates compiled by Bloomberg. Ontario bond yields have shown little sign of stress over the province’s finances, with 10-year bond yields at around 2.46 percent compared with an average 2.8 percent at the start of the previous fiscal year, according to data compiled by Bloomberg. But investors demand an extra four basis points to hold Ontario 10-year debt compared with Quebec which is posting balanced budgets.